As CES 2013, we met up with several companies that were entering the mobile gaming market, particularly on the iOS and Android platforms. We were particularly interested in the Android presentations, given the inherent “freedom” of the platform, as they we able to bring out more “unique” products; mainly saying, new full-blown devices built around the OS. It was a refreshing walk-through of creative approaches to making touch-screen games more friendly to both the casual and serious gamer. I mentioned in a previous article that ZAGG (iFrogz) entered the gaming arena this year with the Caliber line-up. 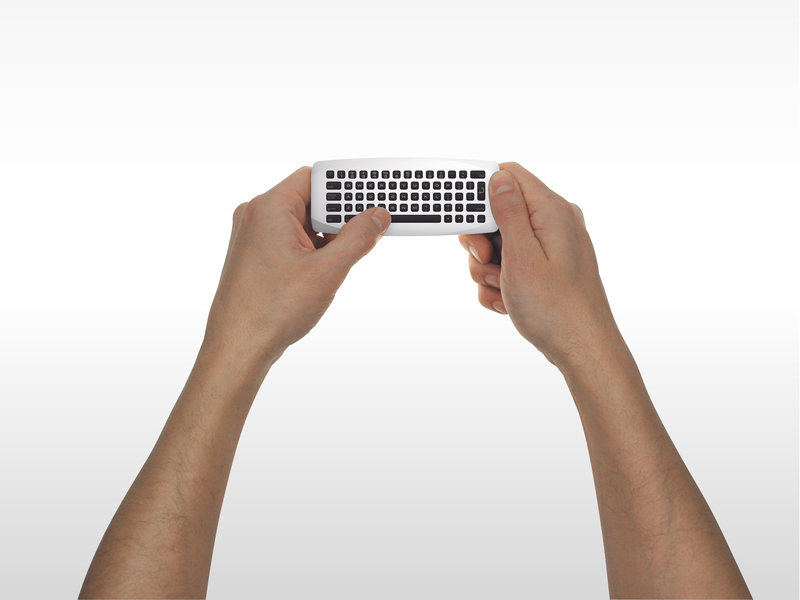 In short, their contribution to mobile gaming specifically was the Caliber Advantage, a sleek iOS phone case controller hybrid. Those controls consist of 2 Analog sticks, a D-Pad, 4 front-facing buttons and 2 triggers. Once the controls slide out from behind the back, the part of the case that holds the phone rotates. This allows you to hold the controller case like a traditional controller, even if the game you are playing only displays in portrait mode. The case-controller has a rechargeable battery that supports 10 hours of gameplay and an out-of-the-way headphone port. While the device is only for the iOS, iFrogz mentioned their interest in looking into other markets. (hint hint) Should you wish to read more about the Caliber Advantage, click here to read my original article and see their demo trailer. controls – a clear approach to the mobile concept. When “closed” the screen is folded in, protecting both itself and the front facing controls, allowing for some self-protecting transport. 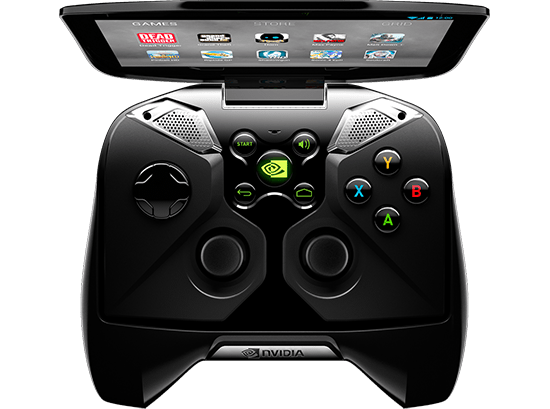 The protected controls consist of dual analog sticks, a d-pad, 4 (game) buttons, and some auxiliary buttons such as Start, Back, Home, a sort of volume control and what appears to be an NVIDIA button. Also on the front of the pad are left and right integrated speakers. Along the top rear of the controller exists left and right bumpers and triggers. And the ports included are HDMI, Micro USB, Headphone, and a Micro SD slot. The device is running stock Android Jelly Bean (sans bloatware, per the NVIDIA rep.) and the 5 inch screen displays at 720p. 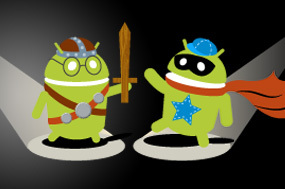 However, its not just another Android gaming device as the device’s biggest feature is remote PC gaming. With 802.11n 2×2 MIMO game-speed Wi-Fi, it comes with an ability to play your PC games from your device, streaming via a wifi connection to PC’s with GeForce GTX 600 GPUs. 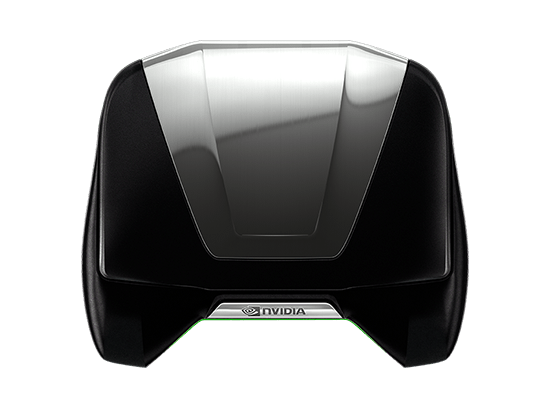 It will be sporting a Tegra 4 processor (Custom 72-core NVIDIA GeForce® GPU – Quad-core A15 CPU) and will work with Valve’s Big Picture, for you Steam users out there. While the release date was not mentioned at the booth, the rep did mention that they are aiming for Q4. 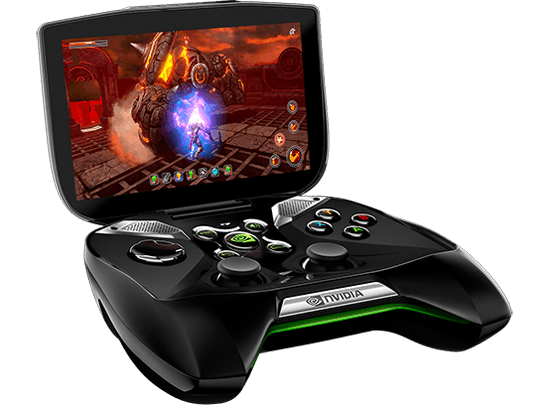 This 0.3 inch thin and 0.7 lb gaming tablet running stock 4.1 Jelly Bean presented by Archos is similar to Project Shield but only in the the sense that its a “tablet with game controls.” Here you have: dual analog sticks, 8 front facing buttons, D-pad, and two triggers. Also on the face, are two speakers, a 7-inch, five point capacitive, 1024 x 600 pixel screen, and a front -facing camera. Internals include a Quad-core Mali 400 MP GPU paired with a 1.6GHz Dual-core CPU, 8GB of internal memory (with a microSD slot for up to 64GB of additional space) and a mini-HDMI. 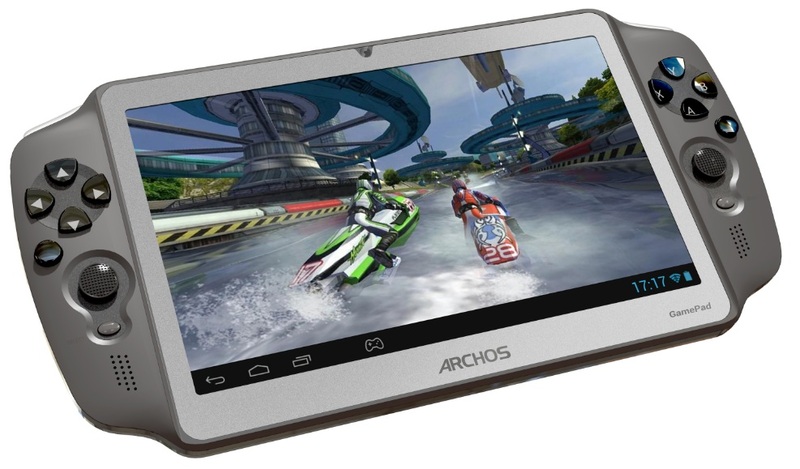 The main weapon with this one is Archos’ patented mapping tool that allows you map any on-screen control to any of the tablet’s game controls. You can now take literally *any* Android game, even if it only has touch screen controls, and play it comfortably using the game controls. Better yet, game-specific control mapping is automatically saved for each game, and will be loaded automatically for that game. You won’t have to prompt the device to load specific control maps every time you play a game. Here is a demo of this mapping tool straight from Archos. 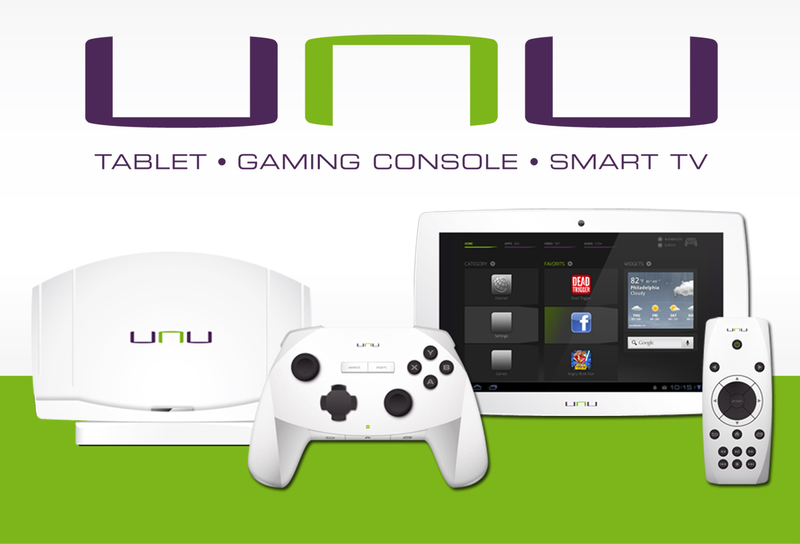 Snakebyte presented UNU, expressed as a full-on entertainment solution centered around an Android 4.2 tablet. The tablet has 7 inch and 10 inch variants, and comes with a TV docking station, dedicated gaming controller, and an air mouse that flips over to reveal a qwerty keyboard. The tablet has a 30 pin dock connector that will be used for power, USB and HDMI out. The internals are not yet finalized as negotiations with processor manufacturers were underway at the time, but the rep we spoke to ensured that it would most likely be powered by a quad core processor. The included gaming controller will also have the commonplace layout: dual analog sticks, 4 front-facing buttons, select and start buttons, triggers and a d-pad. tweaked so that users can swap between dual display, display on tablet only, and display on TV only. Surely its a standard function with laptops, but Android external displays historically only dual-displayed, so displaying on just one or the other allows UNU to take some weight off of its processing. Displaying on TV becomes more of a desire here thanks to the air mouse which allows users to use their tablet by pointing and clicking at the TV screen. Imagine browsing Facebook from your couch, and updating statuses using the qwerty keyboard on the back of the mouse. Last but not least, UNU will also come with button mapping app that was developed in the kernel allowing you to map X and Y screen coordinates to game controller controls, making almost any Android game playable from the game controller. †Archos Game Pad images/video used Archos’s webpage here.